This little cornucopia of flowers is rather cute. I found it in a nineteen seventies book about needlecrafts, which is rather a surprise because I don’t think it is a very nineteen-seventies sort of design – and some of the others really were! I’ll try to find the book to tell you what it was called. It’s the same book that I found the girl and her doll described in this post about another forgotten project. In a fit of masochism (I can’t think of any other reason!) I worked it on watered silk, which is very closely woven and was a severe trial. 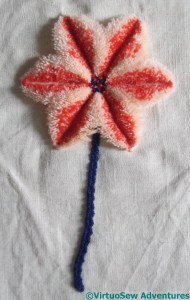 I had to use sharps rather than my usual embroidery needles! 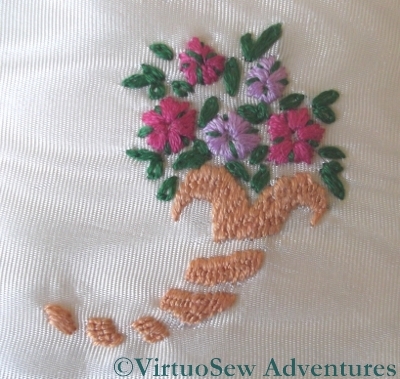 The flowers are satin stitch (I was gradually getting over my aversion! ), the leaves lazy daisy, and the sections of the cornucopia itself are in Roumanian stitch, which creates just enough roughness of texture to be interesting. I think that now I have found it again I shall mount it on a round or oval card (like the Glittering Snail) and add it to the winter decoration corner. Doesn’t it look wonderfully woolly, though! Sometimes there is nothing you can do for people but give them a hug; sometimes even that is rendered difficult, or even impossible, by distance. 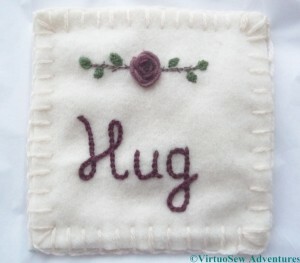 For those occasions, I’ve created a Hug For a Handbag. 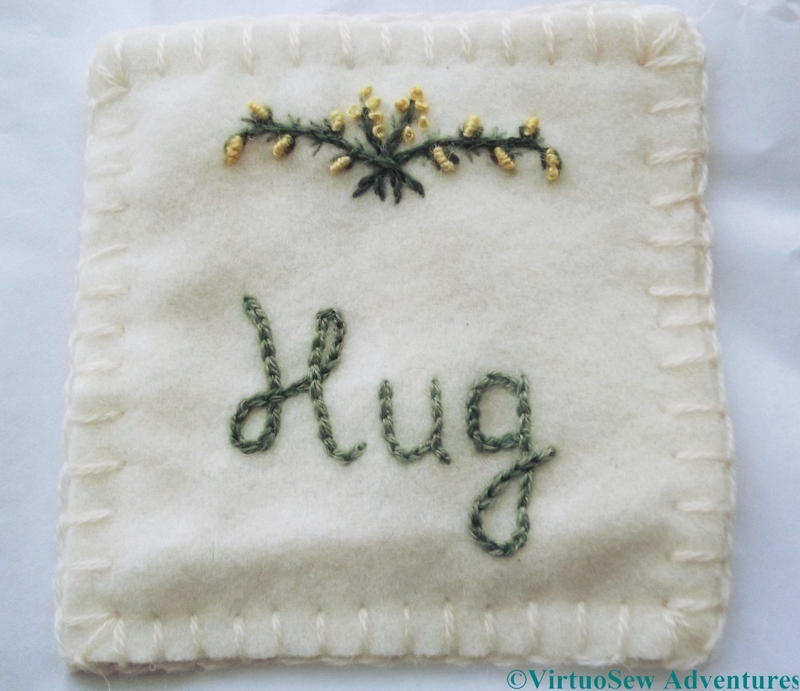 It’s a small square of snuggly cashmere blanketing, embroidered with the word “Hug” and with a small embroidered motif on the top. I have backed these with another layer of cashmere, to make them even snugglier. 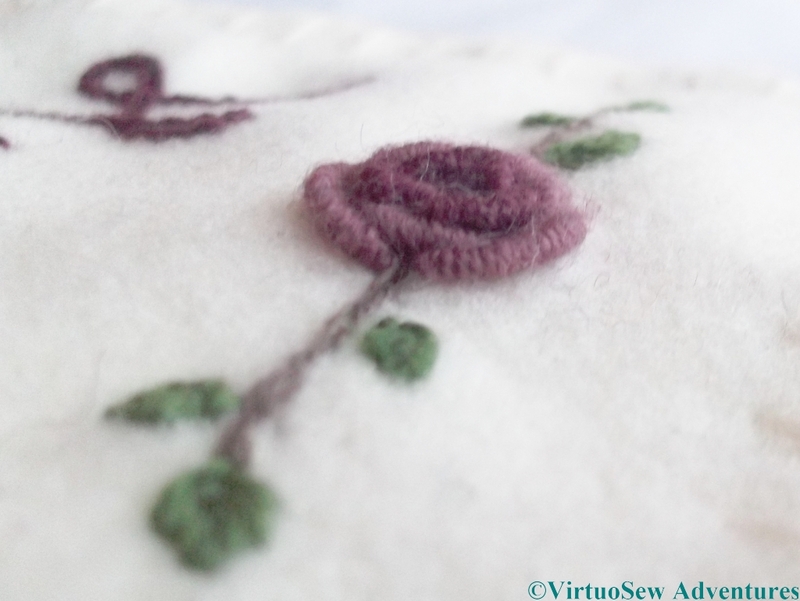 The rose on the Rose Hug is worked in bullion knots, which were not among my favourite stitches, but I’ve warmed to them because the rose seems to have worked so well. 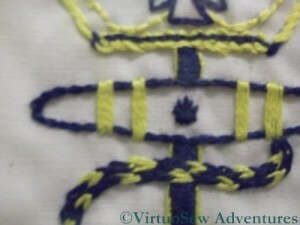 The inner knots are shorter, and worked using a single thread, while the outer ones are not only long enough to have involved a great deal of wrangling to get them to settle nicely, but worked using a double thread. The leaves are worked in nested fly stitches, and the stems in stem stitch (of course! ), with tiny thorns of straight stitch alternating with the leaves. You can tell that I have warmed to bullion knots, because I used them for some of the flowers of the gorse on the Gorse Hug. The buds are French knots, and the thorns and sprigs are worked in fly stitches, using single threads instead of the double thread used for the stems. This is a wonderful use for some gorgeous woollen threads I bought somewhere in Pembrokeshire ten years or so ago (unlabelled, but they are so soft and lovely I wonder whether they came from Renaissance Dyeing) and some more, bought in Australia, which come from Gumnut Yarns). They have been a sheer delight to use. There’s a lovely misty blue in among them, too, so I am thinking of another design, of Lavender, to make up to have ready next time I need a Hug to send out. But on the other hand, I rather like stitching a Hug with the recipient in mind. Maybe they’ll feel the hugs I was thinking when they receive the gift. 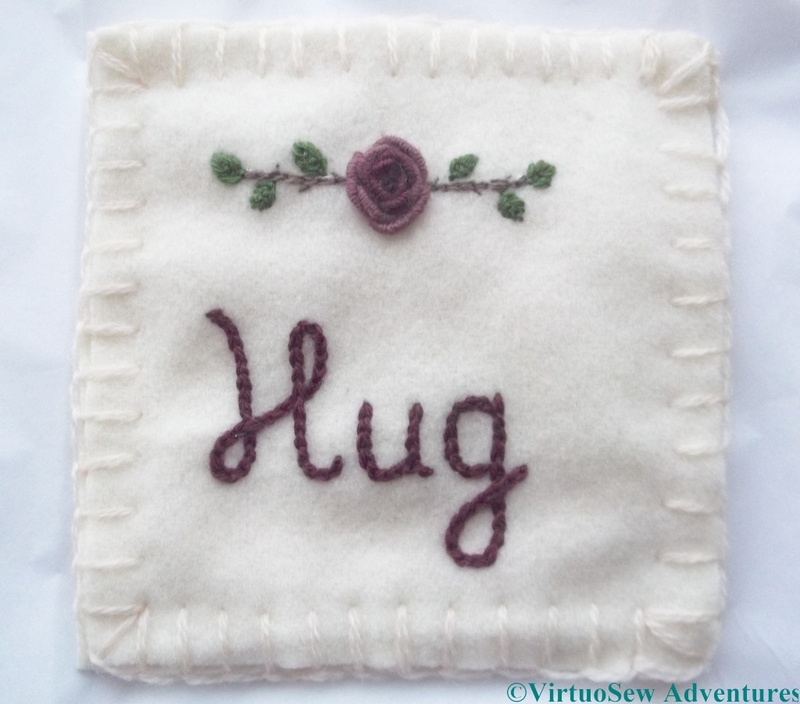 In the meantime, in case you would like to make a Hug yourselves, I’ve made a PDF of the pattern and some brief instructions. Rummaging in the archives is a very salutary experience. This indescribable piece of appliqué is the first embroidery I did without guiding holes in the fabric (like the little mat I described in an earlier post). I remember starting it when I was visiting a friend – it was a rainy day, and I think her mother was at her wits’ end with us. She sat us down with fabric, needle and thread, and (I suspect) prayed for peace and quiet.. Even though the stitches are dog-legged and the colour choices leave a lot to be desired, the piece still reveals things about Rachel-the-Stitcher that I recognise today. One side of the piece for the house is sewn down with blanket stitch, two with running stitch, and one with zigzag back stitch. 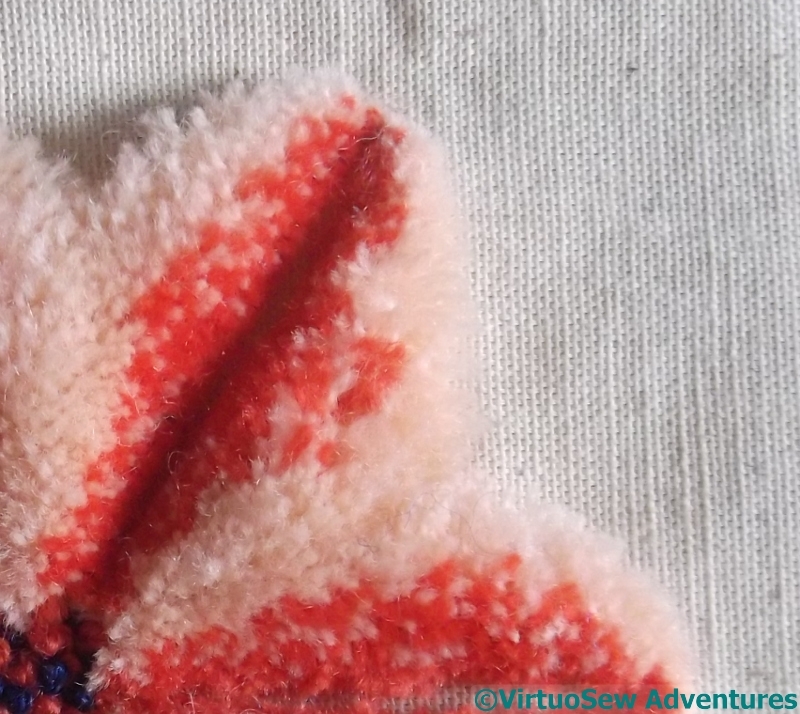 You can take that two ways – either as evidence of my butterfly mind, never sticking to a single method, or as evidence that even then I was thinking about the implications of a stitch. Blanket stitch is a good “grounding” stitch, because of the combination of uprights and horizontals, and the zigzags are rather reminiscent of the wavy edges of some roof tiles. The tweeds chosen for the windows and the pattern-woven braid for the door also show early signs of thinking about what I’m doing – the square patterns of the tweed recalling leaded windows and the pattern-woven braid creating a different texture for the entrance. Grandmama must have worked embroideries galore for her assorted grandchildren. This pyjama case with a chubby kitten on the front was worked for me – I think as a birthday present – when I was about nine, and I’ve rediscovered it among a host of other reminiscences of childhood. You can see the lingering “Make Do And Mend” ethos of the wartime years when she was bringing up her own family in looking at the whole thing, which is actually pieced together to create the final, full size of the pyjama case. It’s worked on a synthetic crepe, too, which many embroiderers today would tend to despise. However, if you zoom in on the picture, you will be able to see the legacy of her teacher Miss Hunter in the beautifully even stitches of the embroidery (nothing complex – chain stitch, stem stitch, and satin stitch). That legacy is also apparent in the care that Grandmama took in lining it just as beautifully. She’s even sewn tapes to the inside of the case so that the strain on the press studs is reduced. I’d almost forgotten about this piece and I was thrilled to find it again! As from today I am going down to just one post per week. 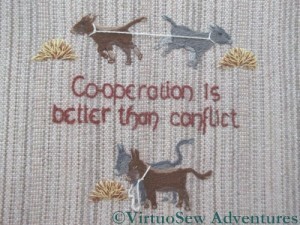 I’m planning a lot of work on the house, and I don’t want to be resenting lost embroidery time. Not least, the ultimate goal is to have a studio, or at least a studio corner, so eventually the work should result in a better life for my embroidery. 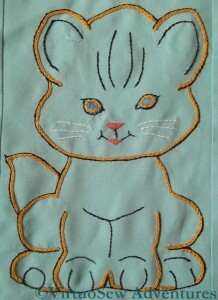 I will still be embroidering, and still writing posts (I’ve found more of Grandmama’s bits and pieces, too! ), but I hope at a slightly more relaxed pace. About fifteen years ago I was going through one of those periods of penury that we are all subject to, so Christmas presents and birthday presents became rather a challenge – usually solved by making something, with varying degrees of success. 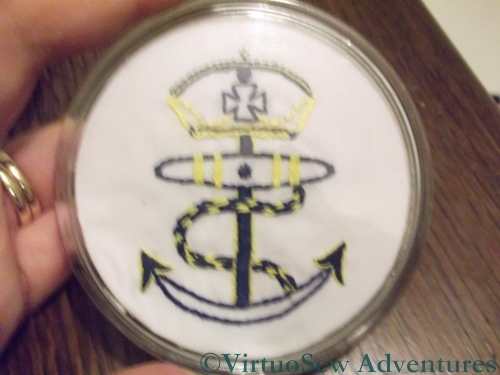 This coaster was made for my grandfather, based on a version of the merchant navy’s Crown And Anchor symbol. It’s worked in ordinary stranded cotton (all I had at the time) and you’ll be surprised what stitches I managed to cram into it! 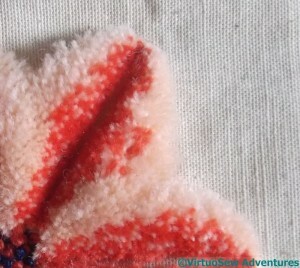 I don’t imagine that Grandad noticed (he only had one eye – the other was glass – and the working eye was short-sighted), but the top curve of the crown is worked in Pekinese Stitch, worked very small and tight, while the headband is worked with the colours the other way around and slightly larger and looser. 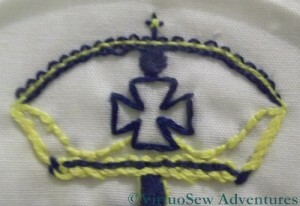 The tiny cross on the top is a composite of an ordinary cross stitch worked over a slightly larger upright cross stitch. 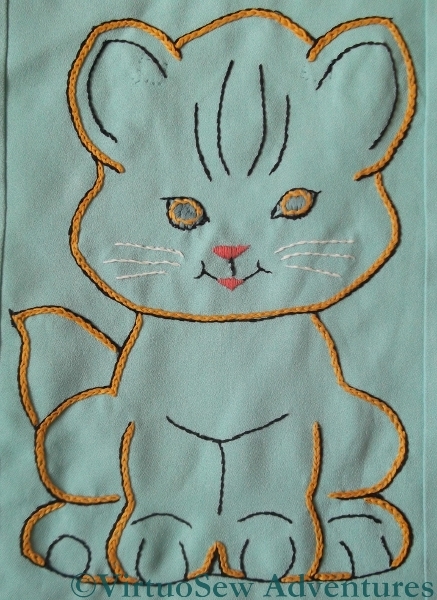 The more conventional stitches of course included back stitch, stem stitch, and satin stitch. The cable that is wrapped around the anchor is worked in two rows of Magic Chain Stitch, purely because (if I remember correctly!) I thought it would be fun and had been twitching to try it ever since I had seen it diagrammed. It worked pretty well in the end, as it happens. It’s not one of my most successful pieces, but it was fun to do, and it came back to me after my grandfather died and now lives beside the spare room bed, ready for glasses of water or cups of morning tea. I suppose you could say I inherited this panel. A local embroideress died, and her daughter gave me (and I believe many others!) various bits of her stash. This was nearly, but not quite, finished. I’ve now finished it and haven’t the vaguest idea where to put it, as I’ve no wall space to spare! It is based on one of the panels of the Quaker Tapestry, which is a fascinating piece of embroidery depicting the history and development of the Society of Friends. The woollen fabric was woven especially for the project, and the kit included not only the woollen fabric, but the cotton muslin backing that they recommend to stop the fabric puckering. I was delighted that the lady was willing to give me this piece to finish, because we had seen the Tapestry (which, like the Bayeux Tapestry, is an embroidery!) 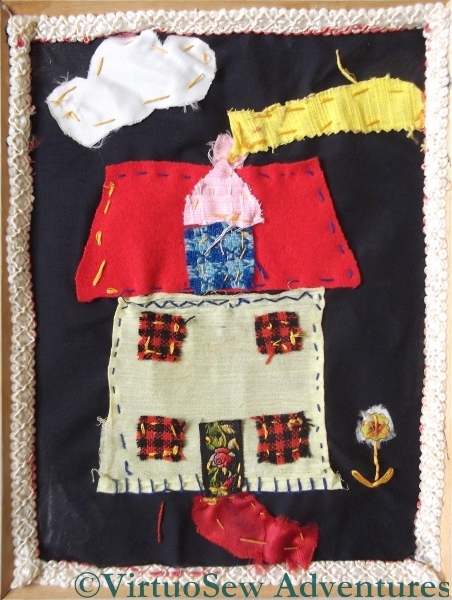 during a visit to Kendal a few years ago, and I was fascinated by the variety of the stitches used, and very impressed by the general level of skill demonstrated, considering that it was embroidered by many groups of people. 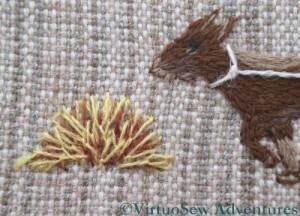 In fact this kit doesn’t employ the whole variety of stitches used in the Tapestry, but I liked the use of Fly Stitches for the hay, and the use of the long taut straight stitch for the rope between the donkeys is just like my use of the same technique in the Camberwell’s rigging!